MHS is a leading provider of Civil Engineering, Surveying and Construction Engineering. individual property boundary surveys to design and commercial layout. the Civil Engineers at MHS will ensure your project is a success. ACI Certified Inspection Technician programs. McAfee Henderson Solutions, Inc. (MHS) is a leading provider of civil engineering, surveying, and construction engineering services in Kansas and Missouri. Established in 2000, MHS has captured a substantial share of the market through commitment to client service. We have a philosophy that every successful project requires Vision, Service, and a Reliable Solution. Our team of professionals possesses expertise in all phases of Land Surveying, Civil Engineering, and Construction Engineering. We go to great lengths to understand our client’s vision so that together we may achieve the objectives. Our partners have the confidence that all project variables have been considered from the initial survey to the final closeout of construction. We take great pride in our commitment to truly serving our clients. Through a shared Vision and our commitment to Service, we deliver a Reliable Solution. We provide a variety of land surveying services including ALTA boundary surveys and complex infrastructure projects. Whether your project involves transportation, storm drainage, sanitary, or special site construction, MHS is prepared. Our team is equipped with the technical tools required to provide full-service inspections from materials testing to written report documentation. 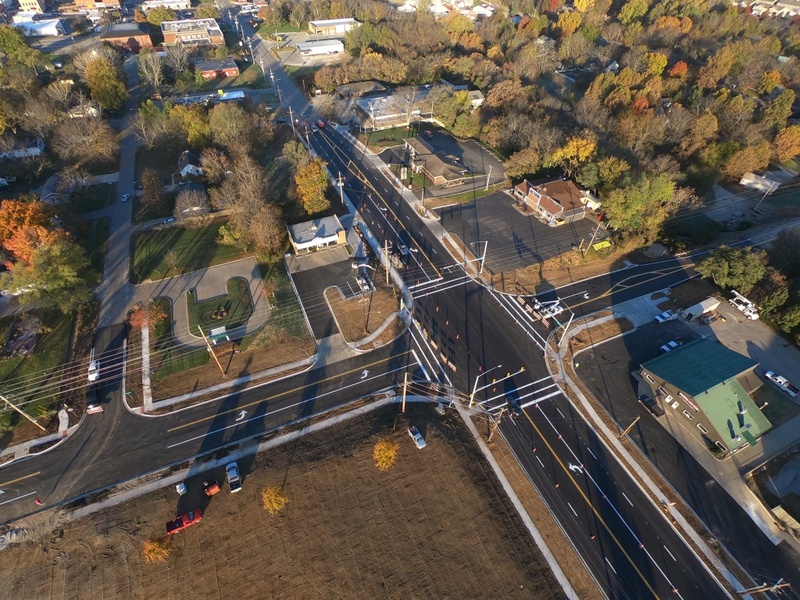 This KDOT Access Management Project in Louisburg, Kansas, developed from a Traffic Signal Needs Study completed by MHS. Upon funding, MHS was selected to provide planning, surveying, engineering design and inspection services for the intersection project. The existing 4-way stop controlled intersection with a single 4-lane approach and three 2-lane approaches was improved to two 5-lane approaches and two 3-lane approaches with a traffic signal. Improvements in addition to the widened roadways and traffic signal include curb and gutter, sidewalks, storm sewers, and utility main relocations over the 1,900 LF of street construction. Careful planning was exercised to minimize impacts to adjacent homeowners and commercial businesses while satisfying stopping and intersection sight distances meeting AASHTO requirements. 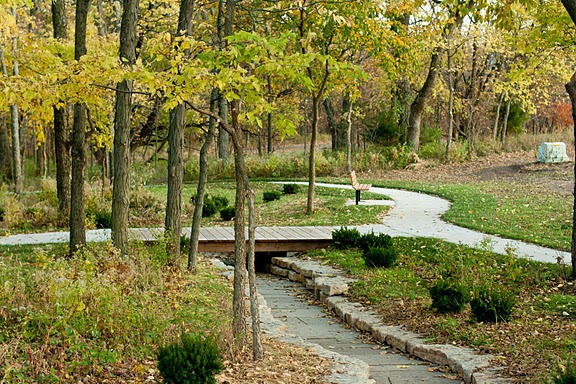 MHS teamed with a landscape architect and worked with City of Lenexa, KS, staff in deriving several concepts that implement the amenities identified in the Park Master Plan. Project design included 7 rain gardens, 7,800 SY of parking improvements, restroom facilities, water and sewer utiliity services, and nature play areas. Duties also included coordination with state and federal agencies and mitigation of critical habitat. Preserving native vegetation and the addition of rain gardens met the required Level of Service derived from the APWA BMP manual. MHS teamed with a local architect in designing a new middle school to service grades 6 through 8. Project includes over 125,000 SF of new classrooms and facilities. Design elements include preliminary plan, final plan, traffic study, sanitary study. 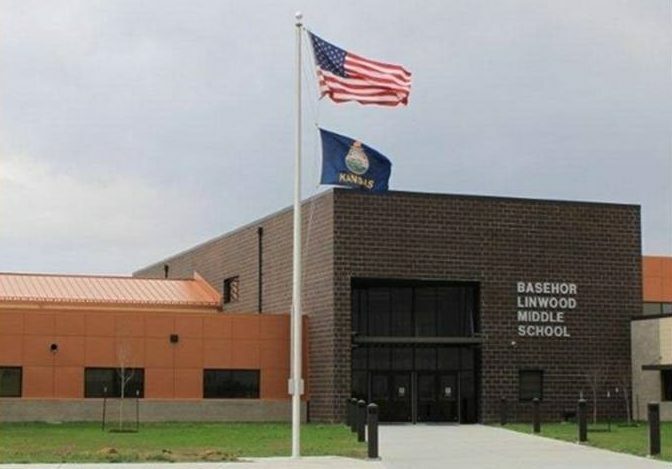 Full construction documents were provided for the associated private site improvements, public roads, sanitary lift station, and detention basins. MHS provided survey and engineering design services for 3.5 miles of ADA asphalt trails from Pflumm Road to Switzer Road in Overland Park, KS, connecting residential, educational, and park facilities. 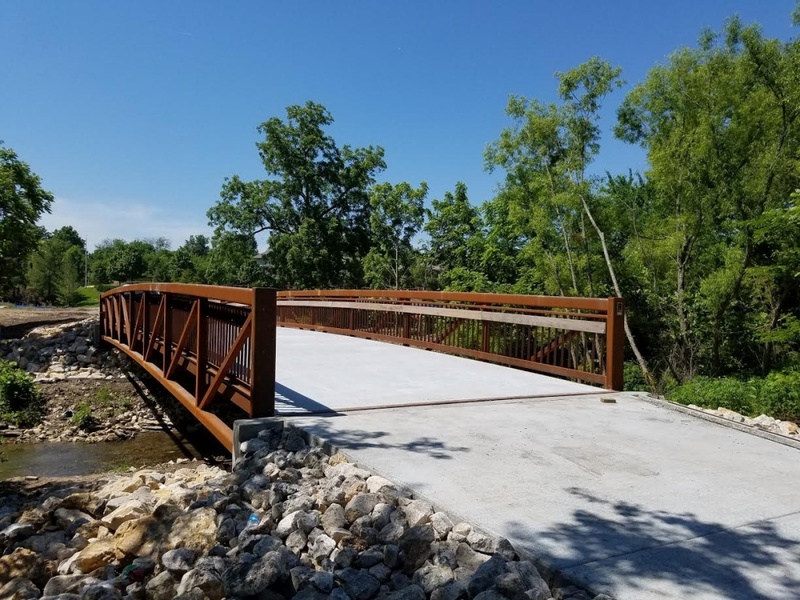 MHS provided abutment design and permitting for 4 additional crossings which required pre-manufactured steel truss pedestrian bridges ranging in span lengths from 50 feet to 100 feet. With each trail crossing being located within the FEMA defined 100 year flood plain, local state and federal permits were provided to show a “no rise” in the 100 year water surface elevation. Additional project duties included trail approach and layout to minimize the impact of the trail construction on surrounding native vegetation, culvert design and HEC-RAS modeling of Coffee Creek. The trails are part of a the Johnson County Parks and Recreation Districts Streamway Park Master Plan.